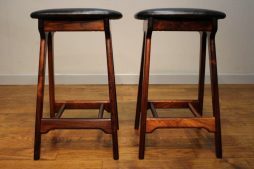 Mid-Century Stools | Interior Boutiques – Antiques for sale and mid century modern furniture, french furniture, antique lighting, retro furniture and danish furniture. 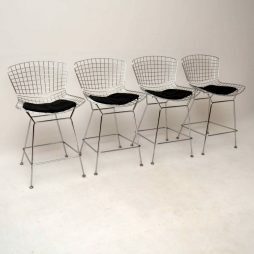 A very stylish set of four vintage bar stools, these were designed by Harry Bertoia, they date from around the 1960-70’s. 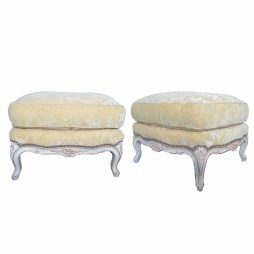 The condition is excellent for their age, with only some minor wear here and there. 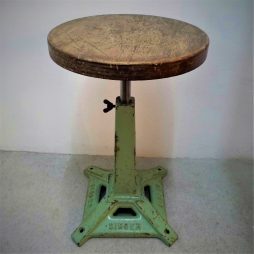 The charcoal coloured seat pads are in good condition, they have just some minor wear and creasing, they could probably be ironed out under a low heat. 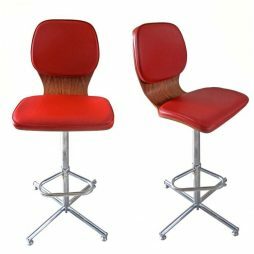 Rare and Original 1950s Rosewood and Chrome Swivel Bar Stool Re-upholstered in Red Leather. 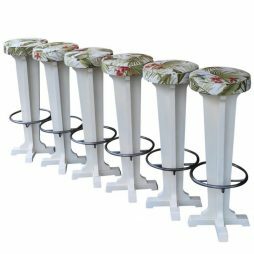 Set of 6 Bar Stools French 1950's. 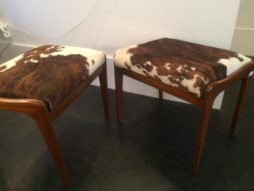 It has been re-upholstered in Aquabloc Cotton Fabric from Brazil. 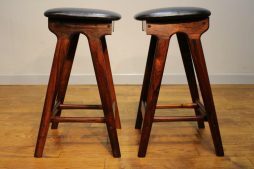 Pair of 1960’s Rosewood Erik Buch Bar Stools – The frames have been cleaned and the seat pads have been re-upholstered in good quality black leather hide. 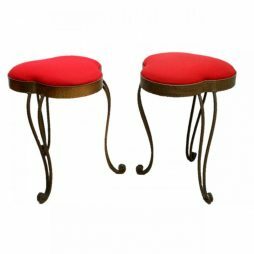 Upon doing some research we identified that the stools originally had a low back rest. 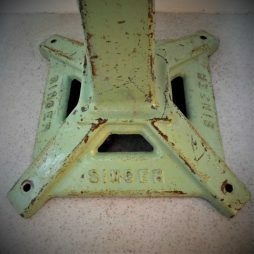 This had been removed at some point during the stools life, and unfortunately not to the highest standard. Our restorer has done a sterling job replacing a back strut using and vintage section of rosewood. 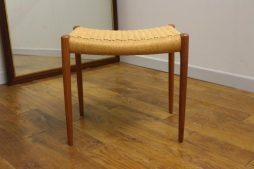 1960s Moller model 80 teak stool . 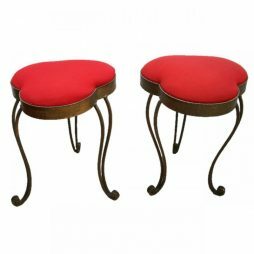 We bought this from a family who purchased mostly from Heals of London from c 1960 -1968 . The owner had the papercord re-done by a professional only 4 or 5 years ago when she was about 90 , so it’s in “as new ” condition . 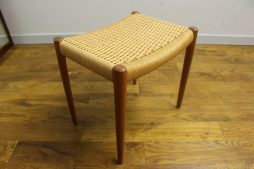 The teak itself is in lovely vintage condition . 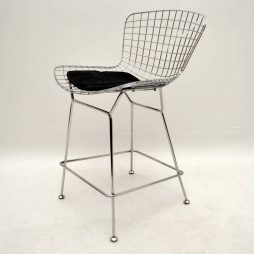 The design by Niels Moller dates to c 1960 , and is still in production at a much reduced size Moller factory today . 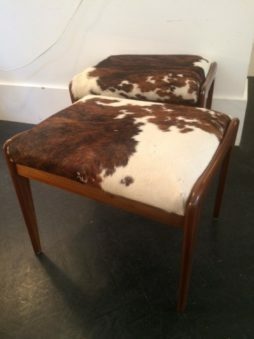 The new ones cost 380 Euros , but as the teak available today is not as good as that available in the early 1960s when this was bought we believe that the vintage ones are nicer as well as being cheaper ! 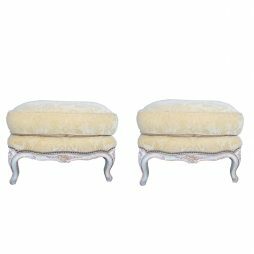 Fabulous pair of gilded mid-century love hart stools ideal for the living room or bedroom adding vintage charm to your home. Attributed to Pier Luigi Colli.